When it comes to casual summer get- togethers like BBQ's and picnics, there's nothing better then good, old-fashioned cole slaw on the side. There are so many different sorts of coleslaw from those tangy flavorful vinegar based choices, to lighter creamy ones. Creamy coleslaws are most commonly prepared since they are always a crowd pleaser. This vinegar based slaw I am going to share today is not as traditional, but really quite amazing. Two nice surprises in this dish are the apples and the slivered almonds which add flavor and crunch. This recipe could easily feed 6-8 adults but it's simple as anything to double and triple if your preparing for a larger crowd. I paired this with some sour cream lasagna (recipe coming soon) and we just couldn't get enough. Also, have in mind that cutting your vegetables up into one universal size will keep this salad looking neat and pleasing. I personally find myself chopping very unevenly as you may have noticed in the photos but it's all about how much time is available. Don't be too hard on yourself that's for sure! This recipe comes together in a snap and I guarantee you it'll be a real hit with your gang too. 2 Medium Red Apples- peeled, cored and chopped in medium sized pieces. 1. 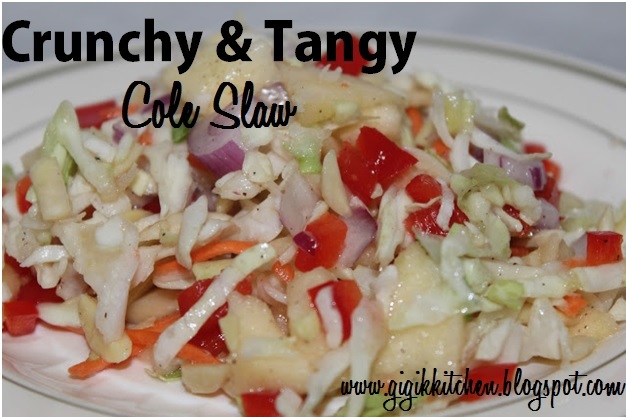 Place cole slaw mix or fresh shredded cabbage in a large salad bowl. If you are using fresh cabbage don't forget to shred in some purple cabbage and carrots as well. 2. Chop the apples, red onion and red pepper into uniform sized pieces and add them in with the cole slaw mix. 3. Add the slivered almonds to everything else in the bowl. 4. Combine the apple cider vinegar, oil, sugar, salt and pepper in a medium sized bowl and whisk up for the dressing. 5. Pour the dressing over the salad ingredients and stir to combine. Serve right away or reserve dressing to pour over immediately before serving. What is your favorite summer dish that you rely on to get you through big family get togethers? Let me know in the comments form below as I love to hear from my readers!